Customs Today reported on the seizure of 18 lbs of crystal methamphetamine, or 'crystal meth' in Jakarta by Indonesia's National Police, with 11 smugglers arrested who were said to be "members of an international drug smuggling ring" operating in the city, and the syndicate said to have been "controlled from China", with drugs distributed from Jakarta to “other big cities throughout the country". 4.6 lbs of the drugs were "hidden inside 14 printer ink cartridges from China", with Senior Commissioner Rikwanto stating that "the syndicate used a new method by hiding their drugs inside ink cartridges and mini diesel machines before they delivered them here". Chief Brigadier General Anjan Parmuka Putra meanwhile noted that the group "distributed the drugs to Jakarta because they saw a higher demand here where people were willing to pay a lot more compared to the Chinese market". One pound of 'crystal meth' is sold for around Rp 300 million ($23,341) in China, but in Indonesia drug dealers can sell the same amount for around Rp one billion to 1.5 billion ($77,909 to $116,863). The raids took place in January, with three separate raids resulting in the seizure and the arrest of the 11 men, with all facing "multiple charges" including Article 114 clause two of the country's Law No. 35/2009, which "carries the death penalty as a maximum sentence". Anjan stated that he hopes "the court will sentence all of them to death, or at least they should get life sentences", and claimed that the raids will have "saved around 8,100 people in the country from drug addiction", while Rikwanto noted that Jakarta's "lavish nightlife" had made it "a lucrative destination for drug-trafficking syndicates". Customs Today pointed out that the Indonesian judicial system “is currently under the international spotlight" as two Australians are facing the death penalty "for trying to smuggle about 17.6 lbs of heroin" into the country in 2005. MarketWatch reported that the survey showed office supply stores earned around $20 billion in revenue in 2014, but that this has "been declining" at an average of about 2.60% every year for the past five years "mostly thanks to recessionary factors" including "weak consumer confidence and low disposable incomes", as well as the "growing popularity" of both "discount and other retailers that may sell similar items". This is perhaps reflected in the recent merger between Staples and Office Depot in the USA, which we previously reported on, and which "couldn't have come at a better time" according to Cartridge World North America, as the franchise network's 1,200 stores expanded in 2014 to "become the only international franchise to provide printers, printer supplies and full-service support" to SMBs, filling a need "that big box and office supply stores are not meeting". IBISWorld stated that "traditional office supply stores have long been under pressure from discount stores, super centers, warehouse clubs and online retailers which are able to offer lower prices, made possible by cost savings achieved through bulk purchasing and low overhead costs", and the article noted that "if you're looking for deals — even on basic stuff for work — you may want to look beyond your neighbourhood office supply store". In turn, office supply store revenue "is expected to continue to fall over the next five years", again thanks "in part" to "increased competition from discount and other retailers". Among the products that are cheaper at smaller stores include printer cartridges, with "price clubs" offering smaller stores "buying power" and meaning they were "often less expensive". The survey added that online retail customers were also "more satisfied with their purchases", which has meant business has been taken away from big and small brick-and-mortar shops in the US. The report did add that for balance that "there are plenty of deals to be had" at the main chains, especially if items need to be shipped, while "savvy shoppers" can "score great deals" through coupons, loyalty programs and "aggressive seasonal sales", or through "being opportunistic" when looking for the cheapest price. 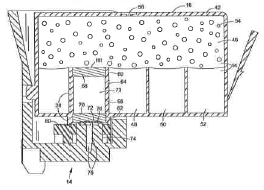 The OEM is attempting to patent the process whereby the foam acts as an airway in the cartridge in Europe, which could be significant for inkjet cartridge remanufacturers. HP’s patent application, EP 2 807 032 A1, refers to an inkjet cartridge featuring a capillary material – the block of foam – which is placed in the chamber of the cartridge between a vent and outlet, in order for the material – when the ink level has gone down – to then form an airway between the vent and outlet. In turn, a wick covering an outlet is provided, or the outlet is otherwise configured to create a break in a liquid connection when the air enters the outlet through the material. This application could be significant for inkjet remanufacturers as the replacement of either the material (the foam) or the wick could be considered an infringing act of the patent, should it be granted by the European Patent Office. 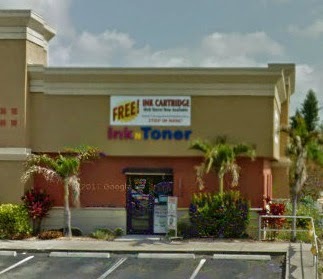 Visit www.priceless-inkjet.com for high quality remanufactured inkjet cartridges and laser toner supplies. 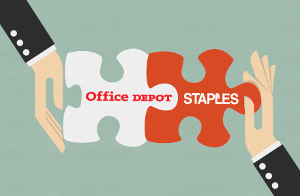 The Wall Street Journal reported that Staples has confirmed a $6.3 billion deal to acquire Office Depot following reports that the companies had been in merger talks; with Staples stating that it has been in discussions regarding a merger since September. The deal would see the US have just "one chain of office supply superstores", compared to three just a couple of years ago, after Office Depot and OfficeMax merged in 2013. As a result, it is expected that antitrust scrutiny will focus on the impact the deal may have on corporate customers rather than consumers; with the article noting that while the federal Trade Commission "waved through" the Office Depot/OfficeMax deal, "the current deal may get a closer look". Amanda Wait, a former FTC litigator, commented that "this investigation is not going to be about where you and I can buy a stapler it is about where a company can buy 10,000 staplers"; and while the market for business customers has had less scrutiny than the consumer market in past deals, part of the FTC's reasoning had been that "the parties will continue to face strong competition for such customers from Staples", and so the current deal may be reviewed differently. However, Ron Sargent, Chief Executive at Staples said that "there are really strong players, who bid on contracts all the time, and have been very, very successful"; such as Amazon which has "just launched a business-to-business office products initiative". Meanwhile, regional office supplies seller W.B. Mason Co.'s Chief Executive Leo Meehan believed it was "too soon to tell whether the merger would hurt his business", noting that while the company is "going to just have this one monstrous competitor every time there's been a merger, each one has over time brought opportunity for us. One way or another, we'll be out there trying". The Recycler reported that the Office Depot/OfficeMax merger created opportunities for Cartridge World, with CEO Bill Swanson commenting at the time that "mega-mergers create new customer opportunities for local retailers everywhere". In terms of customers, the article notes that there has so far been a lack of concern over the deal as they are aware of "plenty of places" to buy office supplies; including online sources. However, suppliers may "view the deal as less of a victory" as “when retailers combine, they often use their new size and clout to renegotiate contracts with their suppliers to push prices down". The decision of the FTC is likely to come down to how much competition is facing the companies, with the article noting that according to experts, "if the FTC believes regional competitors like W.B. Mason and Amazon can provide enough competition to keep prices down for corporate and government clients, they may be more likely to approve the merger", with another factor likely to be “the extent to which companies can buy supplies straight from manufacturers". Daily Mail reported on the invention, dubbed "Scotty" after the Star Trek character responsible for teleporting members of the USS Enterprise crew, due to its ability to rebuild objects in a different location to the original as if teleporting it. Scotty works by scanning an object "layer by layer" using a digital camera. 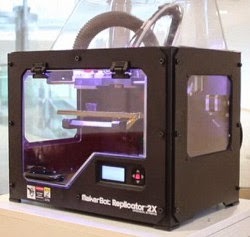 The user is then able to select a 3D printer recipient to "teleport" the object to and press the 'relocate' button, which prompts Scotty to send the object's "encrypted digital blueprint" to the 3D printer. An exact replica of the original object is then printed in layers of plastic. During the scanning process, the device shaves off each layer of the object "using a built-in milling machine" until the original object is destroyed. 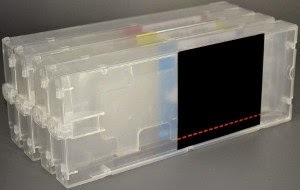 The reason for this, according to the device’s researchers from the Hasso Plattner Institute in Germany, is to "preserve its 'uniqueness', rather than simply copying it" in order to enhance “the emotional value of physical objects shared between friends as the transported item is no longer just a copy, but the only version in existence". In addition, by destroying the original object the researchers hope to address the issue of pirating physical objects which could arise from the use of 3D printers as designs for certain items could be leaked and the items then copied and sold on. The researchers explained: "When the seller sends the object through Scotty, the system guarantees that the seller's object ceases to exist the moment the buyer receives it Scotty allows transferring objects quickly without infringing on designers' rights to be paid for their designs." They added that Scotty could also allow items bought on online stores like eBay “to be sent instantaneously". So far, Scotty is only able to teleport plastic objects in only one color, with the objects also required to be "painted black in order to maximize the contrast for the digital camera to 'scan' it". However, the article notes that as 3D printing technology develops, these limitations could eventually be addressed.